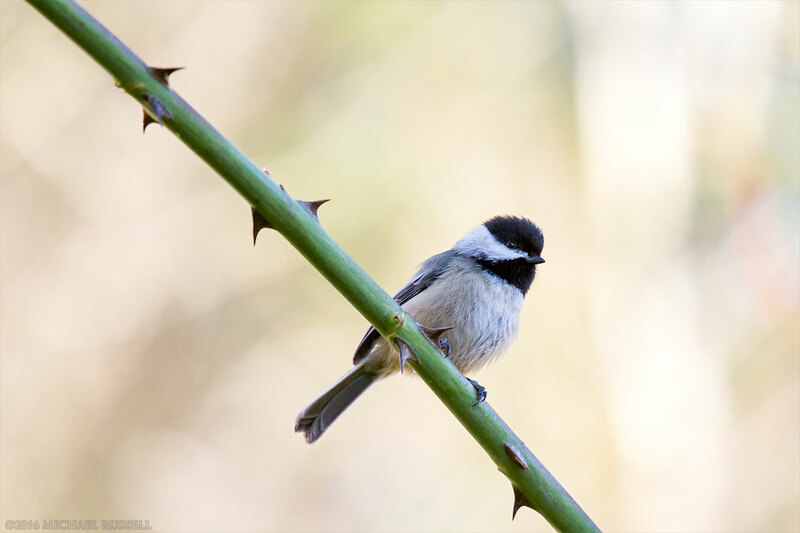 Black-capped Chickadee (Poecile atricapillus) sitting on a Rose branch in British Columbia’s Fraser Valley. This is a Black-capped Chickadee (Poecile atricapillus) I photographed in the backyard the other day. Recently I have figured out that one bird call I’ve been hearing outside is not the usual songs from Chickadees, Juncos and other common local birds, but of a male Annas Hummingbird. I have seen it every day for the last while, and now that I’ve learned the pattern of trees it seems to use, I am trying to photograph it. Naturally it is nowhere to be found when I have my camera out, but is almost in my face when I’m out with the dog (and no camera). While trying to find it and a Golden-crowned Kinglet I’ve been seeing a lot of lately, I couldn’t resist photographing the Black-capped Chickadees and Juncos anyway. This particular Chickadee seemed even more curious than they usually are, and wasn’t afraid of sitting near me in the rose bushes. I actually had to back up at one point to make this photo as it was within the minimum focusing distance of my lens (70-200). Hoping to have the same “problem” with that Hummingbird soon. If I do I’ll be sure to post it here. You can find more of my bird photographs in the Birds Gallery.